Before his launch in politics, Henry A. Wallace was known as a farmer, expert on scientific agriculture, editor, and successful businessman from Iowa. 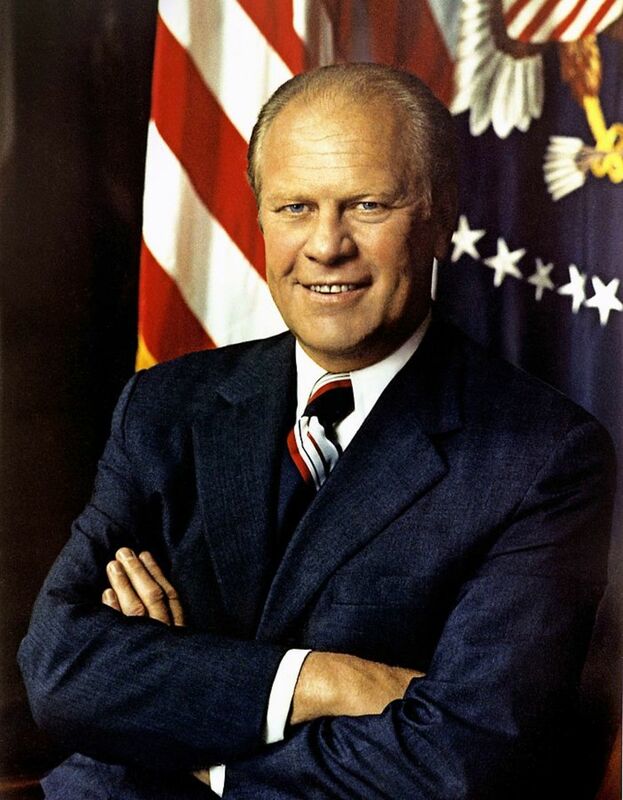 Although he was raised as a Republican, he changed his affiliation after being appointed secretary of agriculture in the Roosevelt administration. Due to his loyalty to President Roosevelt and his liberal agenda, Wallace was selected as Roosevelt’s running mate for the 1940 presidential election. While this was an unpopular choice among a large faction of Democrats, Wallace demonstrated great leadership abilities during his tenure as vice president, considering the overwhelming pressure of the era. Despite his political merits, Wallace failed to win re-nomination at the 1944 Democratic National Convention and was compensated by President Roosevelt with the office of secretary of commerce. After Roosevelt’s death, Wallace maintained his position as secretary of commerce in the Truman administration until September 1945. Following his exit from public office, he became one of the most vocal critics of Truman’s foreign policies as the editor of The New Republic. His desire to make a comeback in politics failed pitifully, with a crushing defeat in the 1948 presidential election. Henry Agard Wallace was born on October 7, 1888, at his family’s farm in Adair County, Iowa. His father, Henry Cantwell Wallace, was a farmer and publisher of farm journals, who would later become a professor of agriculture at Iowa State University and served as a secretary of agriculture under both presidents Harding and Coolidge. 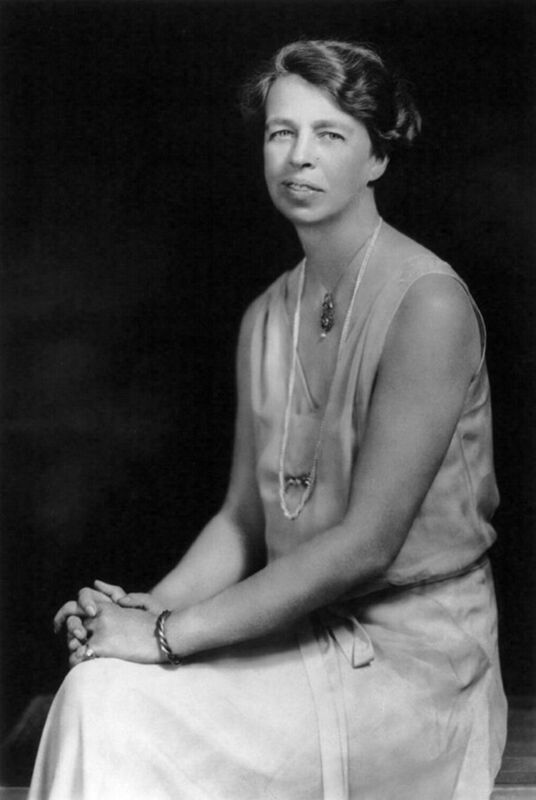 His mother, May Brodhead Wallace, was a college-educated and very religious woman. As a young boy, Wallace was deeply immersed in rural life and inherited his mother’s fascination with plants. When the family moved to Des Moines, Iowa, Wallace maintained a profound interest in nature by tending the family’s gardens. Through his father’s friends and colleagues, he acquired an extensive knowledge of botany and agriculture from an early age. 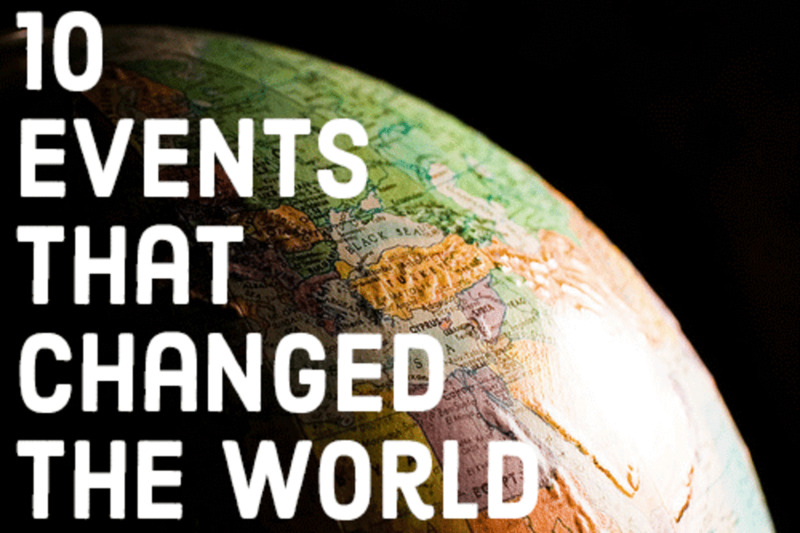 At fifteen, he was already conducting experiments on crops. In 1910, Wallace graduated from Iowa State College with a degree in animal husbandry. After graduation, he began to work as an editor for the newspaper founded by his father, Wallaces’ Farmer. 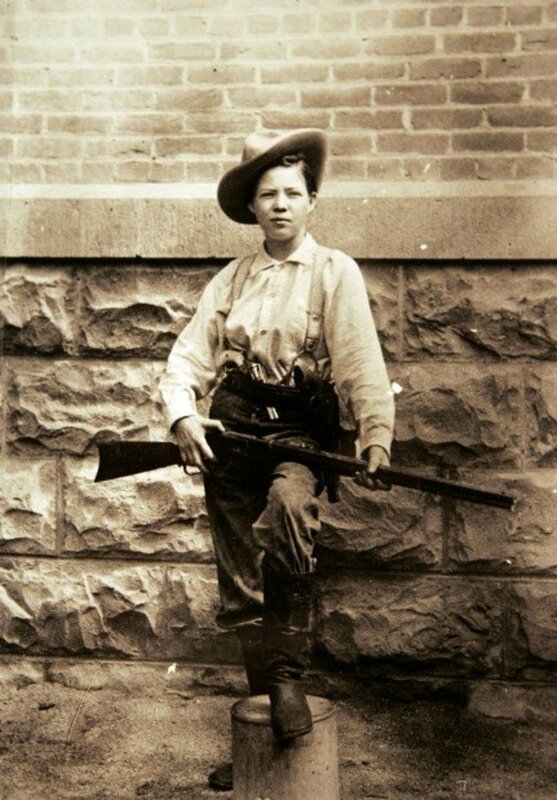 In this period, he met and fell in love with a local young woman, Ilo Browne. The couple married in 1914 and bought their own modest farm. In 1920, after Wallace’s father was appointed secretary of agriculture, Wallace was appointed chief-editor of the family’s influential farm journal. Just four years later, his father died, and the task of running the newspaper fell completely on Wallace. In 1929, Wallaces’ Farmer bought the Iowa Homestead and the two became a joint publication, but the publishing business struggled through the Depression and the family lost ownership. Aside from his job as an editor, Wallace devoted a lot of time to his agronomical experiments, publishing relevant articles in the field. In 1926, his varied interests led him to start his own small corn production company, Pioneer Hi-Bred Corn Company, with the goal of selling a special high-yield hybrid corn. The company gradually turned into a lasting agriculture corporation that revolutionized aspects of American farming and transformed Wallace and his business partners into wealthy men. Besides exploring the fields of agriculture, business, and publishing, Wallace threw himself into the exploration of various religions and faiths, which won him a reputation as a mystic. The closest he would come to admitting it was to say he was “probably a practical mystic…that if you envision something that hasn’t been, that can be, and bring it into being, that is a tremendously worthwhile thing to do.” Although raised in a Presbyterian family, his dissatisfaction with established churches led him towards esoteric movements. In 1925, he joined the Theosophical Society, a group whose mission is to encourage open-mined inquiry into world religions, philosophy, science, and the arts in order to understand the wisdom of the ages, only to resign a decade later. Wallace developed a friendship with Russian artist, mystic, and peace activist Nicholas Roerich. Roerich claimed that in his travels he had found evidence that Jesus Christ had traveled to Asia, and he thought the place would be the location of the Second Coming. Roerich had become quite famous during the era and was nominated for the Nobel Peace Prize and invited to the White House during the Hoover administration. When Roerich was exposed as a con artist who had deceived countless rich Americans by convincing them to sponsor his nonconventional projects, Wallace cut ties with him. During Wallace’s run for president in 1948, his correspondences with Roerich and his associates, derisively dubbed “the guru letters,” were used by his political opponents as evidence of his gullibility. Wallace was a passive Republican until Franklin D. Roosevelt, the presidential nominee of the Democratic Party for the 1932 presidential election, became interested in his ideas on farming and agriculture. To attract the support of Republican Iowa, Roosevelt counted on Wallace and his relationships with influential farm leaders. The strategy worked, and Wallace proved to be an instrumental piece in Roosevelt’s victory in the 1932 presidential election. In 1933, after Roosevelt was sworn in as president, he appointed Wallace as secretary of agriculture, the same position that Wallace’s father had occupied from 1921 to 1924. Gradually, Wallace distanced himself from the Republican Party and switched to the Democratic Party. 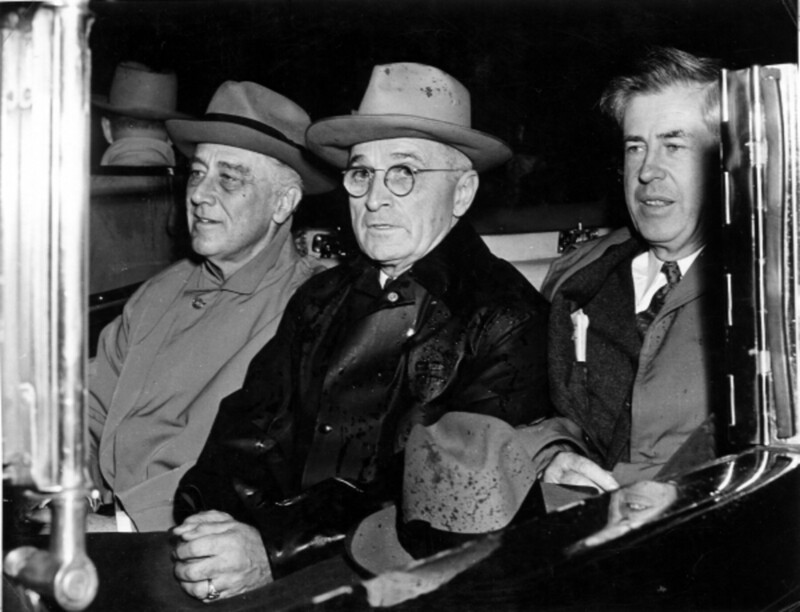 Franklin D. Roosevelt (left), Harry Truman, and Henry Wallace. 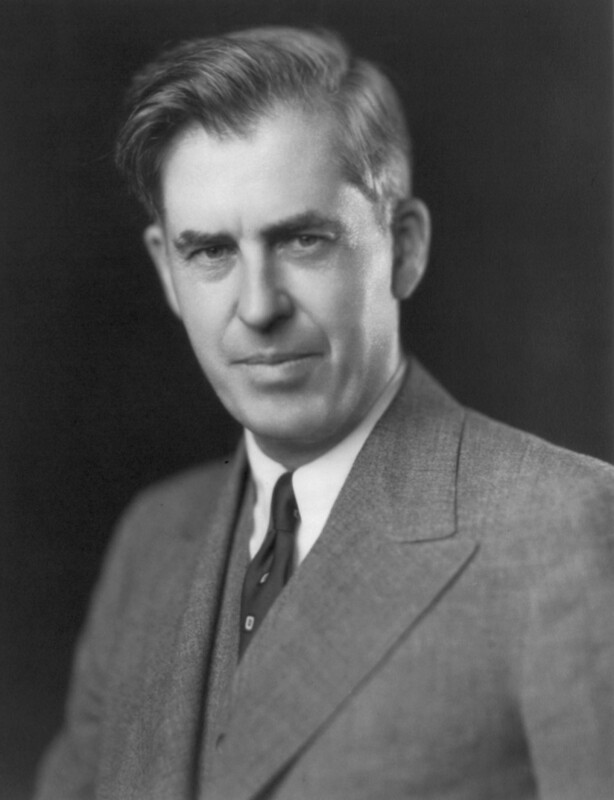 In 1940, after Roosevelt and Vice President John Garner split, Roosevelt decided that Henry Wallace was the only person he wanted as his running mate in the presidential election. The choice was very unpopular among Democrats, who distrusted Wallace, attacking him for his Republican past, his affiliations with esoteric movements, and his blind commitment to Roosevelt’s policies. 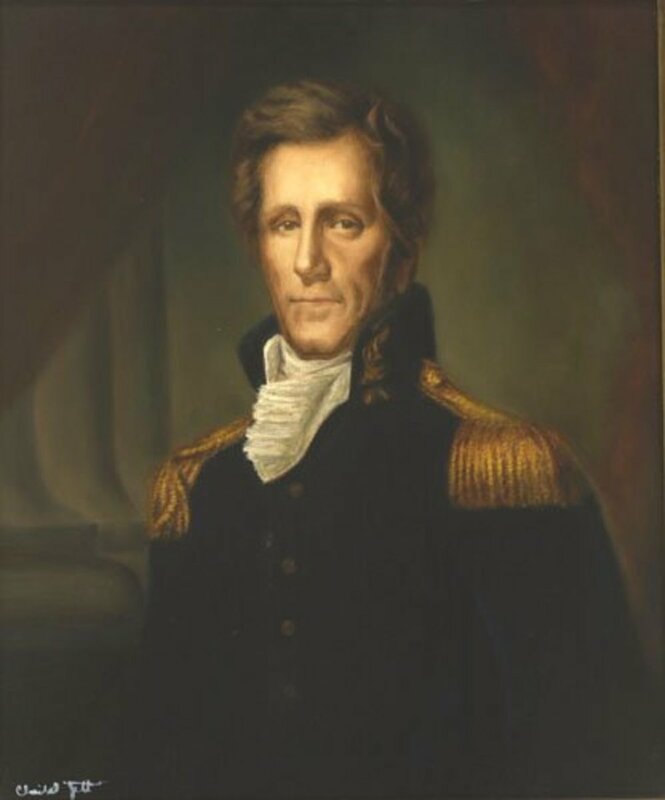 Wallace was not widely known as a working politician, rather, a man of the soil from rural Iowa who was a pioneer in developing new strains of corn. When Roosevelt threatened to decline the nomination, his stubborn insistence prevailed, and the Democrats found themselves with no alternative. Roosevelt explained to the secretary of labor, Francis Perkins, “Henry is the kind of man I like to have around. 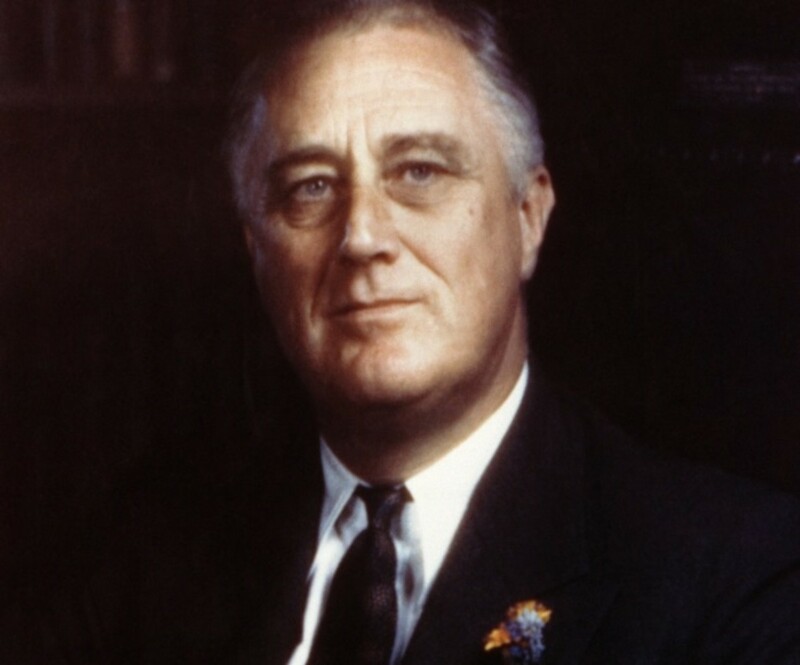 He is good to work with and he knows a lot—you can trust his information…He is as honest as the day is long…He can help people with their political thinking.” In November 1940, Roosevelt was re-elected for a third presidential term and Henry A. Wallace became the vice president of the United States. Wallace’s importance on the political scene increased in July 1941, when Roosevelt appointed him as the chairman of the Economic Defense Board, a new agency specialized in international economic affairs in relation to the European war, in which the United States had a noncombatant but active role. Later, as the international conflict unfolded, Wallace was appointed head of the Supply Priorities and Allocations Board, which managed the shipment of armaments to the British. After the Japanese attack on Pearl Harbor, Wallace took the role of spokesman for the administration. He became chairman of the Board of Economic Warfare (BEW) but gradually got involved in a bureaucratic feud with Secretary of Commerce Jesse Jones. To solve the conflict in his inner circle, Roosevelt simply dismantled BEW and replaced it with a new agency. Wallace lost all his responsibilities in the war effort and was left with limited powers as vice president. At the 1944 Democratic National Convention, Wallace began as a favorite after a Gallup Poll had revealed him as the most popular choice for Roosevelt’s potential running mate in the presidential election. Roosevelt himself had promised Wallace his full support, but political leaders from the administration wanted to remove Wallace from the office. Aware that Roosevelt’s health was severely declining, they didn’t want to accept a scenario in which Wallace would take over the president’s responsibilities. During the convention, Roosevelt gave the delegates the power to make their own choice. 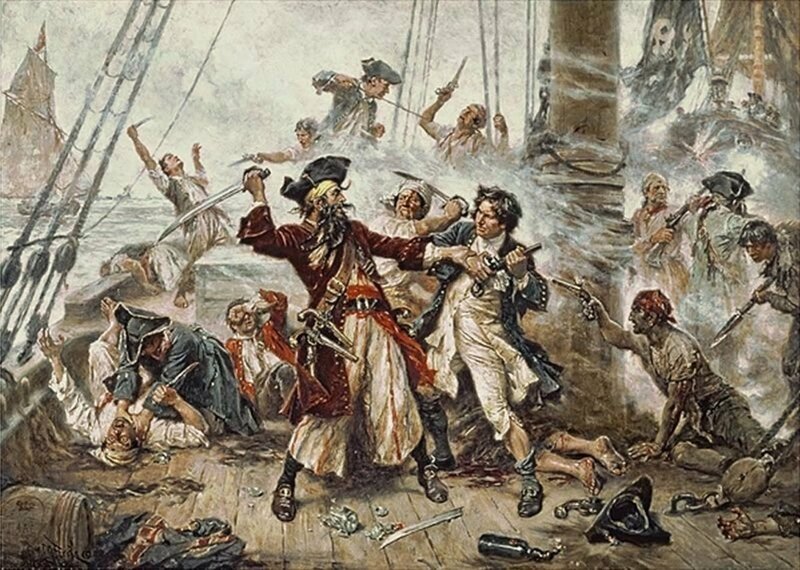 He stated his preference for Wallace but did not insist on the nomination. Although Wallace managed to gather incredible public and political support, he lost the nomination to Harry Truman in an unexpected turn of events. Truman had entered the race with meager chances, but since Roosevelt had proven hesitant, the Democrats were quick to throw their support behind Truman. Later, Roosevelt expressed his sorrow for not fully supporting Wallace, admitting he had underestimated Wallace’s popularity with the public. His experience in the 1948 presidential election dissuaded Wallace from seeking another political office. He retired to New York, where he resumed his farming experiments, making impressive advances such as creating a new breed of chicken with increased egg-laying productivity. He died on November 18, 1965, in Danbury, Connecticut, after being diagnosed with Lou Gehrig’s disease. Henry Wallace’s sudden removal from politics seems unfair now considering how involved he was as vice president, and how eager he was to implement his personal, visionary ideas. 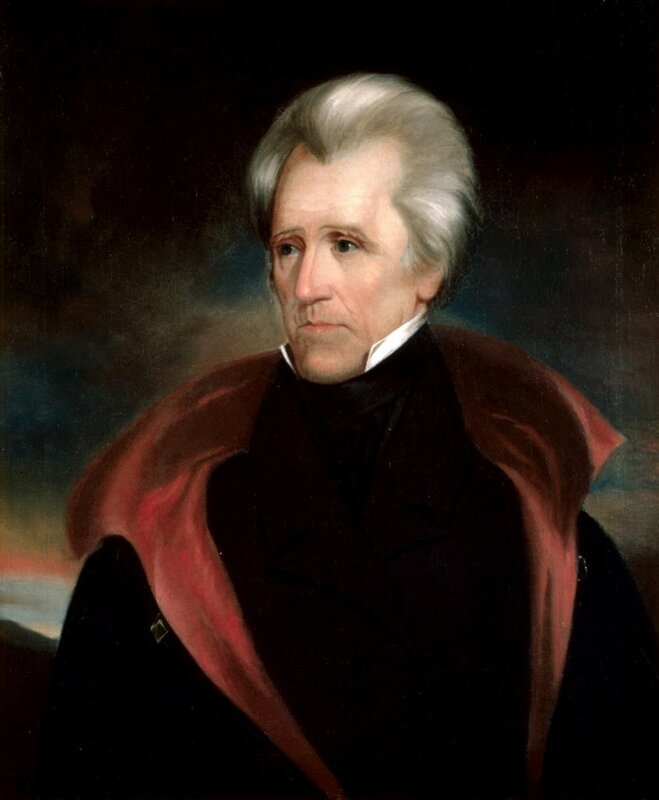 His position on foreign affairs during the war was most likely the reason for his position as a constant outsider. Although he didn’t achieve all his goals, he left a powerful legacy in numerous fields, not just politics. Today, the largest agricultural research complex in the world carries his name: Henry A. Wallace Beltsville Agricultural Research Center, located in Beltsville, Maryland. Henry Wallace, Henry Wallace, America's Forgotten Visionary. February 3, 2013. Truthout. Accessed July 27, 2018. Purcell, L. Edward (editor) A Biographical Dictionary: Vice Presidents. 3rd edition. Facts on File, Inc. 2005. Waldrup, Carole C. The Vice Presidents: Biographies of the 45 Men Who Have Held the Second Highest Office in the United States. McFarland & Company, Inc. 1996. Witcover, Jules. The American Vice Presidency: From Irrelevance to Power. Smithsonian Books. 2014. Interesting, Doug. I liked the way this V.P. had trhrown himself into so many fields: politics, agriculture, and running a newspaper. Wallace and his work will not be forgotten. Thank you for this article.